Think about it: if a string trimmer can slice through weeds, brush, and thick overgrowth, what could it possibly do to you? You might not have realized that any harm can come from using a string trimmer, but the debris that a trimmer flings can cut your skin or do serious damage to your eyes. That means that proper safety gear (including appropriate clothing) is just as important when operating a string trimmer as it is when operating any other form of power equipment. Did you know that the American Academy of Ophthalmology estimates that proper gear could prevent about 90 percent of all eye injuries? While you're trimming, your eyes are at risk of being harmed by debris. Small pieces of weeds, brush, and even broken-off string from your trimmer can be thrown back into your eyes. 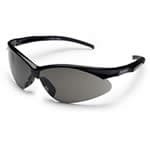 Protective eyewear shields your eyes without encumbering you. Safety glasses allow you to keep your eyes on what you're doing without fear of injury. String trimmers produce sound at a level around 115 decibels. The average human pain threshold is 110 decibels. But it isn't just about sparing yourself pain or being more comfortable while you work. If you use a string trimmer for an extended period of time without hearing protection, the noise could cause serious damage, including long-term or even permanent hearing loss. You can find different types of hearing protection available. Earplugs might be the most common, but earmuff-style hearing protectors are the most effective and comfortable to use. They stay in place and effectively block out high levels of noise. Because your hands are at the forefront of the action, protective gloves are essential to wear when you're holding a string trimmer. Pieces of mulch, stone pebbles, and pieces of the trimmer string can cause injury to your skin at high speeds. 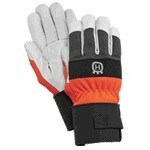 Typically, it's best to use leather gloves or gloves made of a durable woven material that the debris can't penetrate. Kevlar gloves are a sturdy choice. One of the biggest dangers in using a string trimmer is the small distance between the trimmer's line and your feet. All it takes is one swipe of a string trimmer across your toes to tell you that sandals are a bad idea! For maximum protection, wear steel-toe boots. At the very least, wear a pair of leather shoes. Keep your laces securely tied, and make sure your shoes' soles are intact. You don't just want to shield your toes from your trimmer's line; you also want to prevent yourself from tripping. If you prefer wearing shorts, you can opt to protect the fronts of your legs with a pair of shin guards. These will shield your shins from flying debris or accidental cuts from the weed whacker itself. 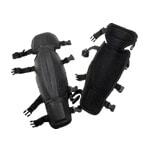 Safety chaps will also do the trick and are available in full-leg or wrap-around styles. String trimmer safety gear doesn't have to be expensive to be effective. A little bit of money spent now on items like gloves and glasses can spare you some large health expenses later and keep your trimming all through the growing season. Protective Gear for Safe Trimming.. Our Power Equipment Direct how-to library can help you learn about How to Measure Cordless String Trimmer Power, Straight Shaft vs Curved Shaft String Trimmers and 2-Stroke vs 4-Stroke String Trimmers.